Spray a 9” (23cm) spring form cake tin or simular with non-stick oil then line with parchment paper. Get yourself a medium or large sized saucepan. Break or cut up the chocolate if required and place it in the saucepan along with the butter an sweetened condensed milk. Place the saucepan on a low to medium heat stirring the contents continually with a wooden spoon for about 8 to 10 minutes until the mixture is silky and smooth and all of the butter and chocolate has melted and combined with the condensed milk. Now take a spatula and pour the contents of the saucepan into your prepared cake tin, take care to pour the mixture into the center of the tin to allow it to spread evenly. 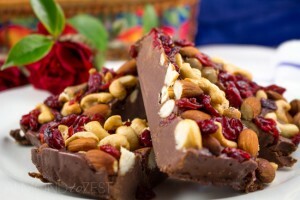 Sprinkle the cranberries, almonds and cashews over the top of the top of the chocolate mixture and press down lightly with a clean spatula or spoon so they are slightly indented into the chocolate. Cool the slice for around 30 minutes on the bench before transferring to the refrigerator to cool overnight before turning out and slicing.